Blogging had taken a step back lately due to a sudden series tsunami.And the influx was so overwhelming, my days and nights were practically swarmed. Thus, it comes as no surprise what my blog post's going to be about...afterall it's TV Tuesday! When it comes to solving mysteries, the name Sherlock Holmes is never far off. What with Warner Bros. even bringing the character to life with a face that strikingly resembles a certain Robert Downey Jr. There's even an Iphone game bearing the same face - which I would probably cover in some other post. 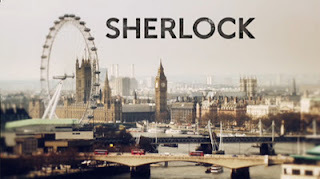 Sir Authur Conan Doyle created the character a few centuries back thus the stories always take place in late 1800s London with cobblestone streets, horse-drawn carriages, Pea Soupers and what-nots. And I certainly do not have any complains about the settings, being a fan of the Renaissance and the Victorian eras. So when I was introduced to Sherlock, the TV series, I was expecting a similar setting and eagerly looking forward to it. (Coincidentally, I am halfway through a Sherlock Holmes novel myself - check out "Aftertot is Reading" at the side.) You bet I was surprised to see a modern London setting to begin with. The thought of "Did I copy the wrong files?" flashed across momentarily but was quickly overwritten by "Wow, a modern Sherlock Holmes! Now, how are they gonna portray this?!" with the first appearance of Dr. Watson, Holmes' trusted sidekick. And I must say, the guys who created this series are just brilliant. They managed to put a modern twist to the stories so well that one would believe the stories are written in the 21st century themselves. Obvious example; Dr. Watson no longer jots down his adventures with Holmes in a journal. Instead he is now a techie guy who owns a blog, aptly named The Personal Blog of Dr. John H. Watson - and yes, it really exists! hahah yes, its just brilliant, rite? Till then, have a happy new year!